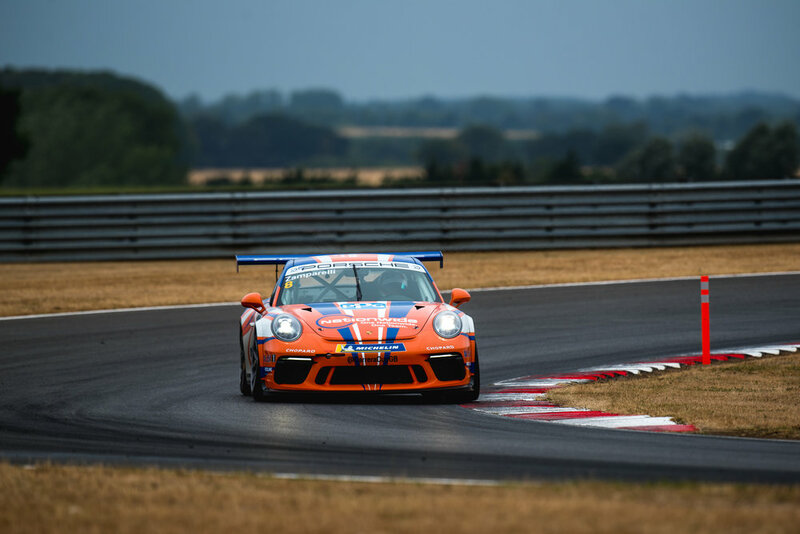 Dino Zamparelli claimed a superb race one victory in his Nationwide Crash Repairs-backed Porsche to regain the championship lead from rival Tio Ellinas. Having competed over 100 laps of the 2.969 mile Snetterton circuit during testing on Wednesday he went into the weekend feeling confident after the traditional mid-season break. Qualifying didn’t quite go to plan however as Ellinas snatched the pole from Dino in the final minutes of the session but Dino would make up for this come race one. With rain arriving over-night and continuing to fall in the build-up to the race it meant the drivers were greeted by a damp and very greasy track. Dino mastered them superbly though to launch off his second-place grid slot to take the lead from Ellinas off the line. By the end of lap one he had a sizeable lead that he would never relinquish despite the best efforts of Porsche Junior Dan Harper. He would claim race one victory by over 7 seconds from his nearest rival. He started race two from fifth place and immediately dispatched Harper who struggled to get off the line. Ellinas was next in his sights and the Bristolian made the move on lap five to take third from his title rival. He then latched onto the back of the dual for the lead but was not able to make any further progress. At the flag it was another podium finish for Dino and another solid points haul to consolidate his championship lead as Ellinas slipped back into second in the standings. On his weekend, Dino commented: "It's great to get back to winning ways and to get back to where we were before our disaster weekend at Oulton Park. The Oulton weekend was purely unfortunate but it happens. It's how you bounce back from those set backs. I feel like we delivered this weekend, by winning race 1 and scoring more points than anyone else. "With the reverse grid for race 2, it's always going to be difficult to make significant progress. But I feel 3rd place from a 5th place starting grid was pretty good. The car felt great all weekend, and I want to thank Redline Racing and Nationwide for helping me unlock a great weekend. I apologised to the team for not delivering the pole position, as it was definitely possible...Something to wok on for next time!" The next rounds of the Porsche Carrera Cup take place at Knockhill on the 25th/26th August 2018.